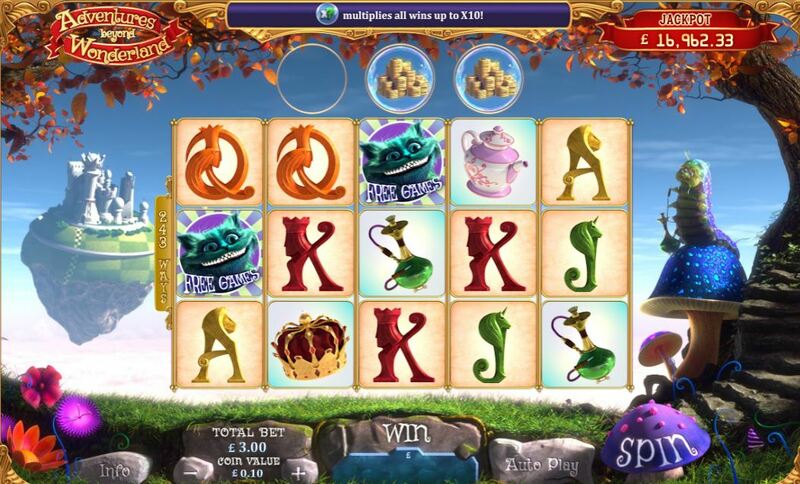 Adventures Beyond Wonderland Slot by Ash Gaming is madder than the Mad Hatter, even more crazy than their Batman Mr Freeze and Riddler Riches games. 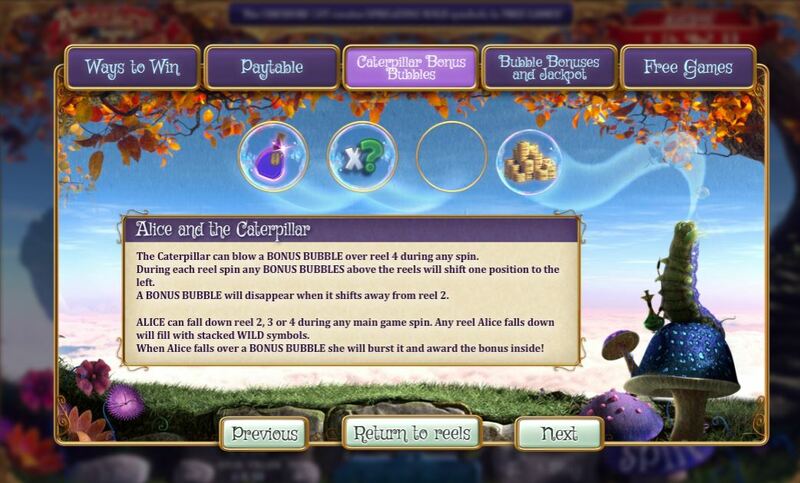 You start with 243 ways across 5 reels of 3 rows but there are bubbles above the centre 3 reels where Alice in Wonderland may drop onto them to create a stacked Wild – if she drops through a bubble that the caterpillar on the right has filled, then you can get cash, or a 2-10x multiplier on any win, but it’s the third option, the potion bottle, that’s important. If Alice drops down and breaks a potion bottle the stacked Wild becomes 2 or 3 reels wide and the game grows for that spin to either 6 or 7 rows giving 729 or 2187 ways for that spin! Land 3 Cheshire Cats on the odd reels 1, 3 and 5 you get him sucked into a vortex beginning with 5 free games, and each time he appears in the swirling mass he gives extra spins until he vanishes for good. You think this game is batty, well it gets curiouser and curiouser as the free games you’ve accumulated take place on the same reel set but this times they spin horizontally (in rows) not vertically! 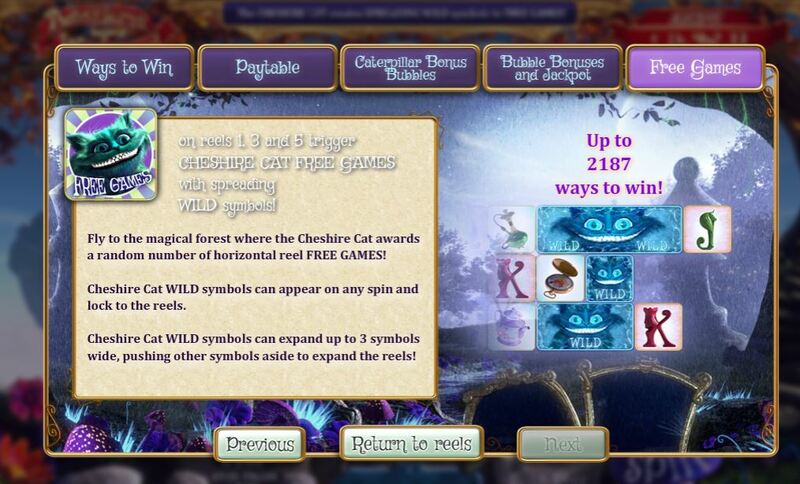 The Cheshire Cat sits smugly by the left of the game and as well as the standard Alice Wilds that appear on all reels in the base game, when he grins he throws his own sticky Wilds onto the grid. If 2 are present on one row simultaneously it expands to 6 tiles wide and if 3 or more the 7 wide. So you can have odd amounts of tiles from 5 to 7 each row and the round tends to be exciting and pays well. 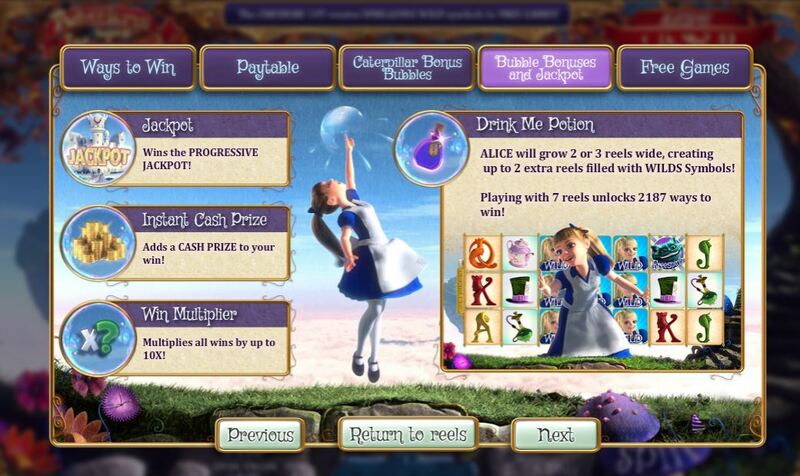 The RTP of Adventures Beyond Wonderland Slot is 89.58-94.60% but some sites may have a progressive jackpot that can appear inside the bubbles above the centre reels for Alice to break as she falls so there may be some contribution to this.